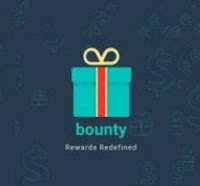 Bounty App is useful ONLY if you are located in Bangalore, Chennai or Hyderabad. How about getting rewards for just checkin at at places. How about getting rewarded for walking into places? ‘bounty’ is a (free) mobile app that automatically gives rewards (Flipkart, Amazon, Recharge Gift Vouchers) for JUST walking into partner places. Partner places could be restaurants or retail stores like cloth stores, shoe stores, grocery stores, supermarkets, book stores, electronics stores, jewellery store, beauty saloons, spa’s, furniture store and many more. With bounty, you get rewarded every time you walk into a partner place. All you need to do is to just register and leave the rest to us. You DO NOT have to remember to open the app when you are at specific partner place. Whenever you are in our partner restaurant/cafe, the app automatically recognizes that and pops up to alert you that you are in a partner place. You can simply tap on the alert to collect bounty points! Here 1 point = 1 Rupee. Get rewards for visiting places! 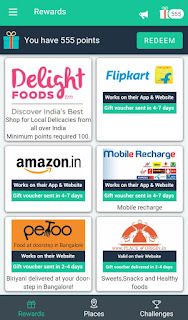 Use promo code 1X208 & get 50 points (=Rs.50) on your 1st visit.